To provide a boost to clean India initiative, the government has imposed Swacch Bharat Cess on Service Tax of 0.5% on all services liable for the service tax, which has been applicable from 15th Nov, 2015. The changes will be required in the tax calculation structure in the versions of Microsoft Dynamics NAV which are running in the market. Insert a new record in the G/L account table as 'Service Tax Swachh Bharat Cess' and maintain the other fields as same as other Services Tax like ECess and SHECess, etc. Create new fields in the tables like Service Tax Setup, Service Tax Entry, Transaction Header, Trans. Sales Entry, and other relevant tables where the Service Tax data has been maintained and also similarly make the changes in the forms related to the tables. 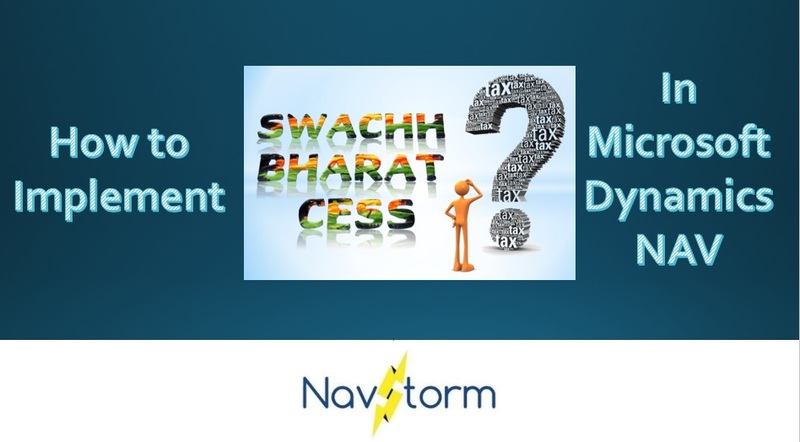 Keep the percentage of Swachh Bharat Cess field as 0.5% in the Service Tax Setup table. Now the fun part, write the code in the POS Post Utility to calculate the Swachh Bharat Cess fetched from the field in Service tax setup and store it in a new variable and use the variable to flow the calculated tax amounts to the tables where the tax amounts are stored. Similarly, write a code in POS Print Utility to print the Swachh Bharat Cess with other taxes which are printed in the Final Receipt (also Pre-Receipt in case of Hospitality store). Sb cess .it will work or not as a reverse charge . The Service Tax SBCess% is to added in Service Tax Setup Table. It will also work as a reverse charge as it is a part of Service Tax Setup.